Various causes can make a person’s eyelid turn the wrong way. In some cases the eyelid “turns in;” in others, it “turns outward.” These conditions can lead to pain, irritation, and problems with tear drainage. The team at Millenium Park Eye Center can correct both of these eyelid conditions with surgery. If your eyelid turns inward, this is known as entropion. This usually occurs on the lower eyelid. The lid may be turned inward at all times, or only when the eyelids are closed tightly. Either way, when this happens, the skin and lashes rub on the cornea, which can be very painful. It can also make the eye sensitive to light and wind. Entropion is usually a result of simple aging, as the muscles around the eyes weaken. A spasm or simple relaxing of the muscles near the eye can cause the lower eyelid to turn inward. Other causes can be an injury to the lid, a congenital defect, skin infections or certain inflammations. People who have had facial surgery, such as a facelift, are more prone to entropion. Although there are non-surgical options to address entropion such eyedrops and Botox injections, the condition usually needs to be corrected with outpatient surgery by Dr. Setabutr. The area is numbed with local anesthetic, sometimes with light sedation depending on the patient. If the entropion is due to muscle weakness, Dr. Setabutr may remove a small section of the eyelid to tighten the muscles in the area. If entropion is due to scars from injury or a prior surgery, he will utilize a skin graft to reposition the eyelid. In contrast to entropion, ectropion is a “turning out” of the eyelid. Again, this typically occurs on the lower eyelid. 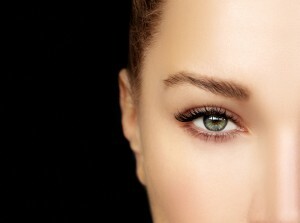 The sagging skin of the inner eyelid is exposed, either in one part of the lid or across the entire lid. Ectropion prevents tears from draining correctly out of the eye, leading to chronic tearing, redness, pain, a gritty feeling, crusting of the eyelid, mucous discharge, even a breakdown of the cornea. As with entropion, ectropion is usually a result of the muscle weakness that comes with age. Ectropion can also result from nerve damage, sun damage, tumors, burns, or eyelid surgery (blepharoplasty) where too much skin was removed. The condition can also be congenital. Artificial tears can provide temporary relief from the dryness that accompanies ectropion, but surgery is usually necessary to fix the condition. The surgical options/methods are similar to those for entropion. If muscle weakness is the cause, a small portion of the eyelid may be removed, and the muscles tightened. If too much skin were removed during blepharoplasty, a skin graft would be necessary. If you have an eyelid turning the wrong way, don’t wait to have it addressed. Call the team at Millennium Park Eye Center, 312-996-2020. We’ll check it out and get the condition fixed.